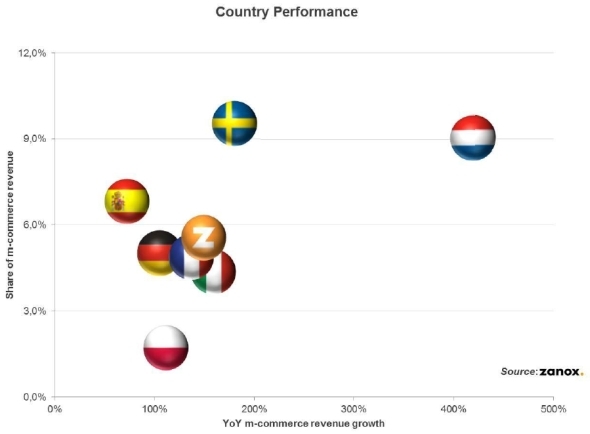 Zanox has observed a 150% increase in revenue generated by mobile throughout Europe over the festive season in 2012 as part of its Mobile Christmas Shopping 2012 report. European e-commerce’s mobile share has also been on the rise and currently stands at 5.6% compared to 2011’s 2.2%. Scandinavia has shown itself to be more evolved in the channel. Mobile share of overall revenue in the country stood at 9.6%, which is more than triple 2011s 3.1%. The substantial growth of 180% was second only to Benelux, which includes Belgium, Netherlands and Luxembourg. The Benelux region managed an upturn of 419% and was found to record the highest annual mobile revenue growth by Zanox. 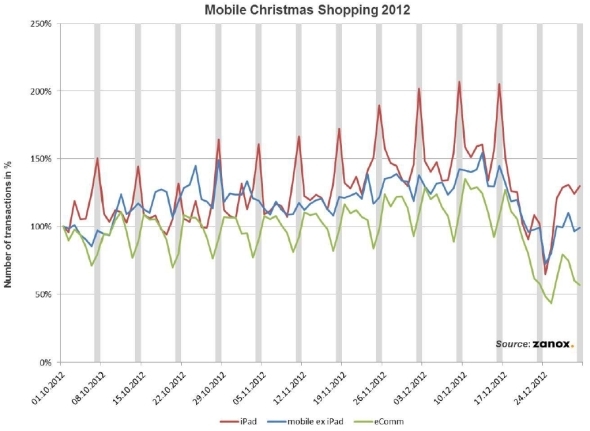 Its mobile share of Christmas e-commerce in 2012 more than tripled to 9.1% from 3% in 2011. Germany, considered to have one of the strongest economies in recession-hit Europe, lies some way behind Scandinavia, Benelux and Spain. The country’s M-commerce revenue doubled in 2012 and its total European e-commerce revenue was up to 5% from 2.1% in 2011. Consumer behaviour feedback from the affiliate network was particularly interesting. Zanox has nicknamed Sundays, ‘iPad Sundays’. iPad user activity on Sundays increased and sales became greater from one week to the next across the Christmas break. Apple’s iPad was the number one m-commerce platform on Zanox’ network. The tablet device had a 54.2% share of all m-commerce revenue throughout Christmas. The iPad also made 47.1% of all m-commerce transactions during the same period. Stefanie Lüdecke, Chief Sales Officer at Zanox, said the time for testing mobile’s waters was over. She warned that companies should now be adopting the mobile channel and integrating it into their e-commerce strategy. “E-commerce companies will have to terminate the period of testing and evaluating in this channel this year, at the very latest. M-commerce needs to become an integral part of company’s sales strategy,” she said.